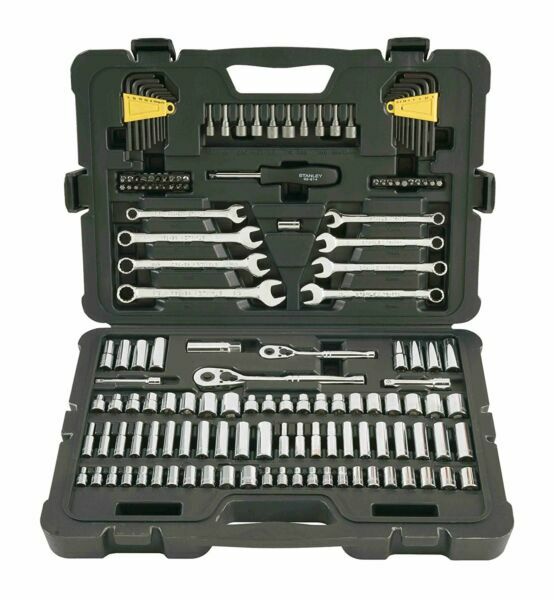 The Stanley 145-Piece Mechanics Tool Set contains 3/8 in. drive and 1/4 in. drive pear-head ratchets accompanied by 70 SAE and metric sockets along with 30 specialty fastener bits, 12 combination wrenches and 16 hex keys among other tools frequently used to build, maintain and repair mechanical equipment. Each ratchet has a quick-release mechanism for expedient socket detachment and a reversing lever allows ratcheting power to be flipped easily into counterclockwise mode. These heavy-duty tools are constructed with chrome vanadium steel to power through rigorous applications where leverage and high torque are critical.